Every product by XMark Fitness is crafted in such a way toincreasethe level of your expectations. With the help of that, your muscles will tone up and get bulk if you are following its range of fitness offering. Utilizing machine, barbell or weight set, will become an option to rest in your hands, though choosing any equipment you’ll be delivered with efficient workout and unquestionable results. From high quality barbell construction to smooth and comfortable adjustment, XMark Fitness hasavariety of options to fulfill your fitness requirement. With a length of Seven feet, the XMark Elite Series Commercial Olympic Bar is one of XMark Fitness production that delivers great quality in a very budget friendly price. 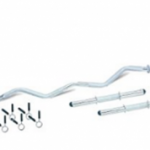 This bar consists of massive 185,000 PSI tensile strength which subsequently shoots the weight capacity of this bar up to 1500 pounds, along with the weight which is only 20 kilograms. The construction on the bar is done through heated alloy steel, while the sleeves are specifically made with hard chrome. The bar is coated with black manganese phosphate to prevent the bar from getting rust and corrosion. With standardized specifications, the bar consists of dual IPF and IWF knurl marks which are very moderate. The XMark ELITE SERIES 7′ Commercial Olympic Bar consists of 185,000 PSI tensile strength which is pretty massive and has the ability to bear a weight capacity up to 1500 pounds. Asthe barhas a weight of only 20 kg, so expecting such bigger numbers from XMark Fitness on its weight capability is a very surprising stuff. 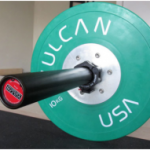 While the bar does have a moderate bend while lifting that kind of heavy weight, usually during exercises such as deadlifts, squats and cleans, but it is tested very precisely that it doesn’t bend whatsoever. The needle bearings always produce a good impact on rotation and whip of the barbell, while in XMark ELITE SERIES Commercial Olympic Bar, there are six needle bearings which facilitate the collars to provide a comfortable and repetitive spin. The model number of the bar is XM-9061 and it is very easy to find on different sites and stores. Frombeginners to professional liftersthe bar is ideal to be used at home or commercial. The shaft is coated with superior quality and is crafted in such a way to provide maximum durability and design. The coating on the shaft is of black manganese phosphate that helps the bar preventing rust, better than black oxide coated bar whichhas the issue of chipping and tearing of layer after several uses, but in black manganese phosphate coating there is no such issue if you handle and maintain the bar adequately. 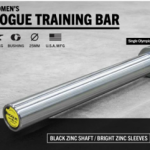 With such coating, the bar is said to have a bit of sticky look and feel, which is very eye warming and lets you to train with the bar more often. The knurling on the bar is moderate having dual specification with IPF and IWF knurl marks. When knurling and coating are combined, the bar gives a strong firm hold which helps to grip the bar very tight. The sleeves of the bar are constructed with hard chrome that works very smoothly on six needle bearings. Needle bearings are always mostly recommended than the low quality bushing bars, due to the fact theyprovide repetitive motion and good spin. Needle bearings are kind of expensive than bushing bars because XMark Fitness protected this bar through double snap rings. Hence giving the user a good range of spin and whip even in heavier weights while making the sleeves never disjoint from the shaft. 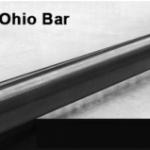 XMark ensures you high quality commercial bar with extensive tensile strength. Constructed using good quality alloy steel and double snap ring system, the XMark bar provides great performance for CrossFit, Olympic and Powerlifting. The XMark ELITE SERIES 7’ Commercial Olympic Bar is a moderately priced bar but it’s a good investment due to the fact that the bar comes with needle bearings and hard chrome sleeves. It is recommended to protect and maintain its durability by using some type of protective coat and oil. The WD- 40 and three in one oil are one of the best coats done on many hard chrome bars, to protect the barbell from dust while increasing its life span. The bar has a tensile strength of 185,000 PSI. Hasa tendency to withstand weight up to 1500 pounds without a bend or break. The shaft of the barbell is coated with black manganese phosphate. Having moderate knurling the bar consist of dual specification of IPF and IWF standards along with no center knurl. The length of the Olympic bar is seven foot. The diameter of the bar is 28mm which is pretty standard too. The actual weight of the barbell is 20 kilograms. In my opinion, the XMark Elite Series 7’ Commercial Bar is a very high quality equipment that gives great value of money. 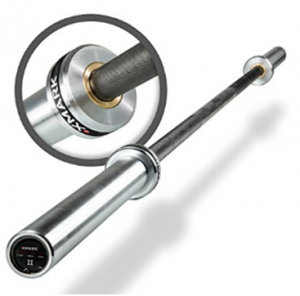 From shipping to usage my experience with this XMark Fitness Barbell was very impressive. The bar was shipped on my door step within a week and came in two well packed boxes which didn’t damage or scratch the bar. With that black manganese phosphate coating, the bar looked very sharp and its design was also up to the finest level. When I handled the bar from the shaft, I found that knurling is very moderate though my hands are pretty big which made the knurl to fit in my hand very firmly. When I did my first workout with XMark Elite Series Commercial Bar, I feltthat the spin of the bar is very impressive due to six needle bearings which were working really well, while producing a very minor sound which was amenable. After several use, I saw that the black manganese phosphate started to chip and peel off very easily. So for that I contacted XMark Fitness customer service and they advised me to light coat the barbell with WD-40 and three in one oil. I followed their instructions precisely and soon after sometime I saw impressive results. Overall, it is recommended to purchase XMark Elite Series 7’ Commercial Bar because of its durability and good value of money. Black manganese phosphate prevents the bar from getting rust and it better than black oxide. 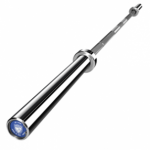 The barbell is very durable as it is constructed with alloy steel while having hard chrome sleeves. The bar has the ability to withstand wear and tear of regular gym abuse. The massive tensile strength increases barbell endurance while the weight capacity is perfect for professional weight lifters. 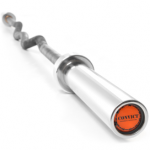 Comes with dual knurling of IPF and IWF standard. Black manganese coating produces discomforting smell. The black manganese easily chips off. The bar is expensive, which comes with no lifetime warranty. The bar can’t be racked after every set or exercise as the coating may peel off very easily.